We didn’t get around to making toffee during my pastry skills class. I just remembered Chef Shan shouting, “and if you add cream to this, you end up with toffee!” Toward the end of the ten weeks, I asked him for a toffee recipe and he said he couldn’t give the secret recipe away. Okay, I understand – confectioner’s secret. Chef Will was the same way with his toffee recipe. I watched his perfectly square blocks of gorgeous toffee while he demonstrated tempering to the professional pastry students. 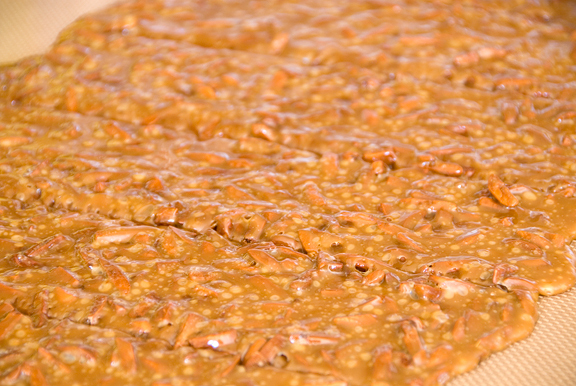 I looked online, looked in books, looked online some more and settled on a recipe in Candymaking (Kendrick and Atkinson) to begin my foray into toffee today. Dealing with candy makes me more nervous than baking yeast breads because of the elevation adjustment. I can handle tanking a loaf of bread, but it doesn’t stress me out quite the way a pot of hot seized sugar does. But this was remarkably easy and well-behaved. I heated the toffee to 343F instead of 360F (minus 17 degrees for 8500 ft.). 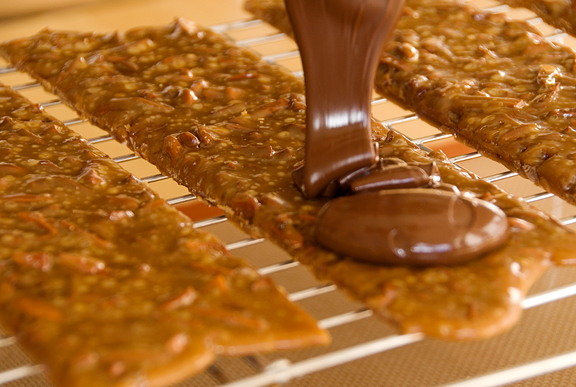 I think next time I’ll add the almonds a little later as they were a little toastier than I like in my toffee. I also hadn’t tempered chocolate since class ended in June, so I tempered about 12 ounces of Guittard. I forgot how quickly the temperature shoots up. After agitating and seeding, it was ready for pouring. 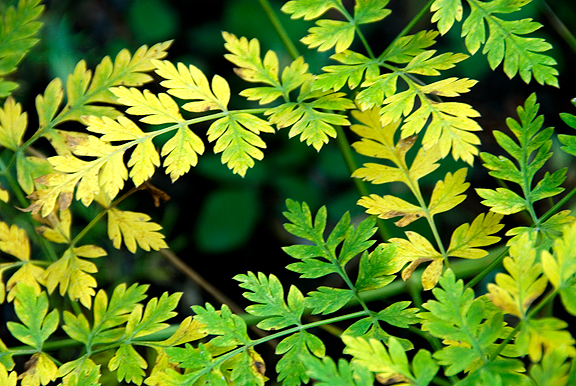 It has a mild smoky flavor and delicate salt burst on the tongue. I thought I’d top the toffee off with this just for kicks. 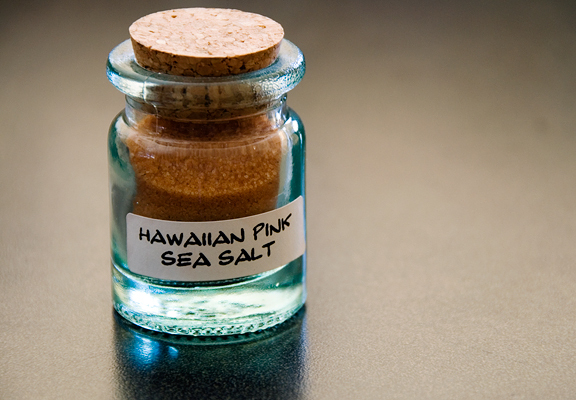 I do miss that wonderful crunch of the fleur de sel, but I think I prefer the more even distribution from the pink sea salt. We took the pup for a walk while the chocolate cooled and the sun made its way toward the horizon. 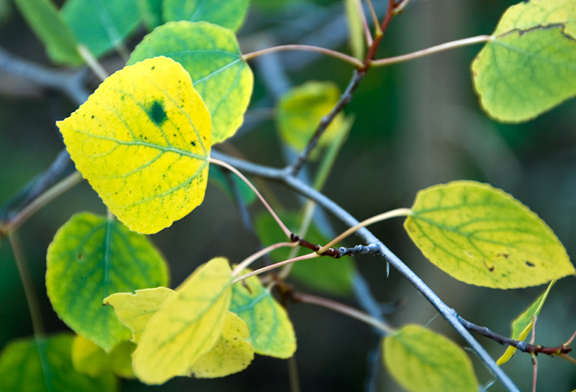 Summery aspen stands are beginning to show the tiniest hints of autumn’s approach and the undergrowth is beginning to glow the gold of the Rockies. By the time we got home I noticed the toffee was set and… bloomed. I knew the temperature got a little too high. Darn. Jeremy didn’t seem to mind. I stood there frowning at the pile of bloomed chocolate on the toffee and he assured me that I’m learning and hey! 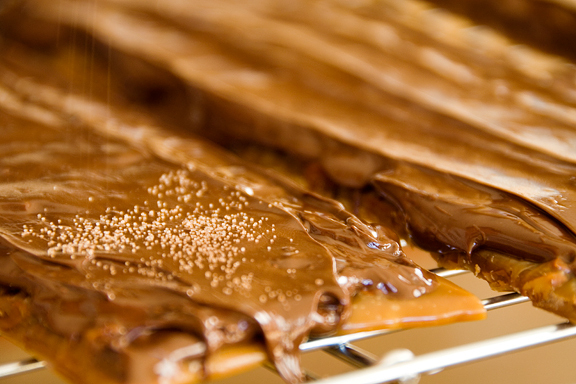 look at all of this delicious toffee! It’s just like freshman chem lab. Butter a 15″x10″ jellyroll pan (I used a silpat); set aside. In a saucepan, combine corn syrup, water, and sugar. Heat on high (360°F or 180°C). Stirring constantly with a wooden spoon, bring mixture to a boil. Add almonds (I would add these much later) and butter; stir until almonds are brown. [Jen’s note: the mixture will be pale yellow and it will bubble for several minutes while you stir. Watch the temperature, keep stirring, and as it passes the hard crack stage, it will begin turning darker as the temperature rises. When it reaches 360°F, remove from heat.] Pour candy into prepared pan. As candy begins to set, score lines with a heavy knife. Allow candy to cool completely at room temperature. Break along scored lines. Temper chocolate and pour over candy or enrobe pieces. Sprinkle salt on top before chocolate has set. Makes 1 1/2 pounds. well my dear kell, i think it will satisfy the heath bar cravings if you add the nuts at the last minute. 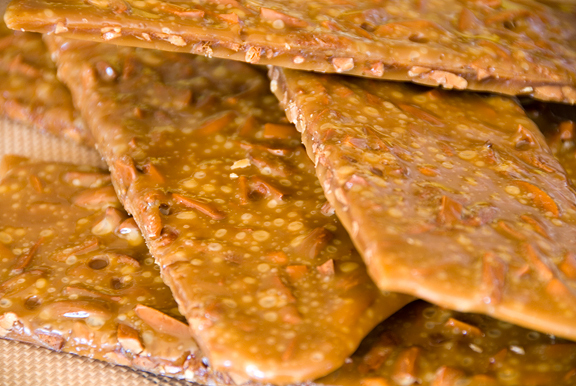 this batch has a strong flavor of toasted almonds (like, really toasted, but not quite burnt). i actually want to try it with pistachios or hazelnuts. and we *did* mix them up with some ice cream! delicious. your bday is in another day, no? package will be late – but i promise i will send it this month. i just don’t know if i will finish henry’s present by then! My uncle Jesse worked for the Heath Company in Robinson literally from it’s inception as a dairy. He became plant manager in the forties, and on one visit, Mr. Heath came out to my dad’s car and brought me a vanilla ice cream cone – the best ice cream with a unique flavor that I have never experienced since. To my knowledge, the original toffee recipe has never been duplicated, but I am going to work with this version and try to get it right. All my living cousins are willing to be taste critics. I will be selling the final version in my Sugar & Spice bakery in Grand Rivers, Ky.
Emily – I really like my stainless steel all-clad saucepan for candy making. I don’t have experience with glass pots, but stainless lasts forever and you can beat the hell out of it. 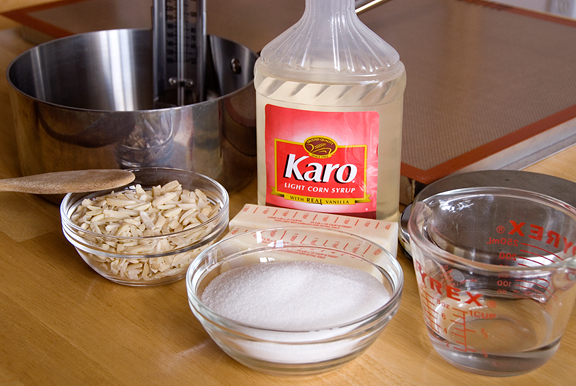 Just make sure you have bar keepers friend on hand to scrub the stubborn stains out. Good luck! 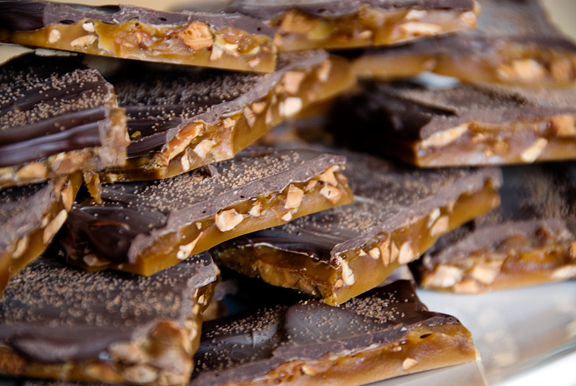 I was looking for a toffee recipe and lo and behold…here is yours. Thanks for saving the day! !